So like all kids, I’m guessing you enjoyed playing with “Micro Machines” and “Hot Wheels.” If you were a Playstation user, I bet you like the high speed sci-fi racing series “Wipeout.” And like all everybody everywhere, you probably think “Mario Kart” is awesome. So if I were to tell you that there was a “Hot Wheels” styled kart racing combat game like “Mario Kart” from some of the makers of “Wipout,” would that be something you’re interested in? Well I hope so, because that’s just what we’ve got, and it’s called “Table Top Racing.” In it, you compete in several races, circuits and events against a variety of different model toy cars, which are unlockable and customizable, in both single player and online multiplayer modes. Rather than a simple sprint to the finish though, you’ll also use several weapons against your foes including the leader finding heat seeker missile and a beyond devastating EMP bomb. The best part of “Table Top Racing” is it’s care with the subject matter. 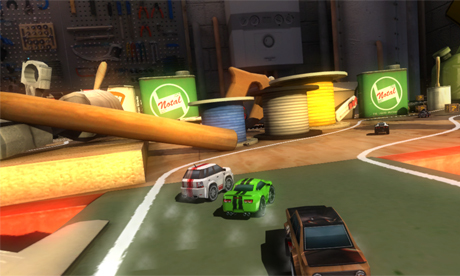 Everything about the game feels like playing out the most involved of all your toy car racing fantasies, a feature highlighted by the game’s best aspect, the tracks. 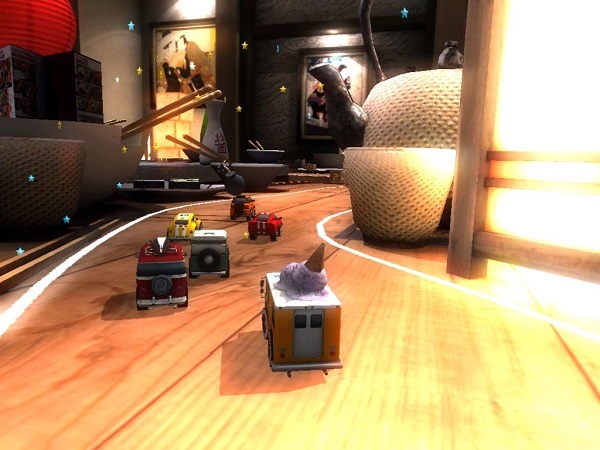 All of the eight tracks are cleverly designed common world environments modified to create racetracks. For example, you’ll find yourself maneuvering around sandwiches on a picnic table at a Bar-B-Que, winding around oil cans on a work bench, or (in the best and most appropriate level) racing through a child’s room surrounded by classic toys. The track design is inspired and vibrant to the point of being almost distracting at times, but the brilliant layout keeps them fresh and even learning to keep your eyes on the course takes nothing from their creativity. As for the gameplay, it’s not near as fast or hectic as the “Wipeout” and “Mario Kart” series that inspired it, but the controls are tight and races are almost always competitive, due in part to the influence of the variety of weapons, and some reasonably challenging AI. There’s always a competitive spirit to the game that somehow never overwhelms the loose sense of fun. There aren’t enough racing games like this available on mobile systems, and there are none as good as “Table Top Racing.” I wish there were more shortcuts, races, tracks, and speed, but when your biggest knock against a game is that there should be more of it, that’s generally an indication of things going right. That is certainly the case here as “Table Top Racing” does many, many things right, leading to an intense, yet casual approach to the mobile racer with just the right amount of nostalgia to fuel it. As a, most likely, adult, you are too old to play with your toy cars anymore. With “Table Top Racing” though, you’ll never miss them as it’s the best game of toy cars you never got to play as a child, and my app of the week.